The Family Support Network was for the past three months the chosen Charity by famous Quiz Master Julie Cooper, who is holding quiz night every Wednesday at Bambooshay. Supporters from all walks of life sharing tables and have their brains picked with 30 tough questions. During the intermission the hat goes around and the quizzers are dropping donations. Whatever is collected is then matched by a supporting business. Over the last three months a total of $2,715.00 was collected. That amount was matched by Conyers Dill and Pearman Trust Company and an envelope with $5,430.00 was presented to executive members of Family Support Network Judith Charles and Gayle Lettsome. Earlier in the year funds were collected for the BVI Cancer Society. A total of 1,900.00 was collected. 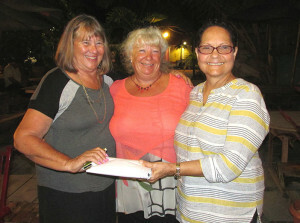 That amount was matched by EUREKA Medical and a total of 3,800.00 was presented to President of the BVI CS Gloria Fahie. From this week on the beneficiary of the weekly quiz night will be VISAR, Virgin Islands Search and Rescue. VISAR is an organization mostly run by volunteers and with us practically surrounded by water this is one of our most important NGO’s, which have been able to save countless lives over the years. ROMASCO Group of Companies has agreed to match funds raised dollar by dollar.